Denny Hamlin finished fifth in Sunday’s NASCAR Sprint Cup Series race at Pocono (Pa.) Raceway, overcoming early miscues to drive through the field for his seventh top-five result of the 2012 season. Hamlin restarted fourth following the 160-lap event’s final caution with nine laps remaining but was too tight to challenge eventual winner — and Joe Gibbs Racing teammate — Joey Logano, who scored his second-career win. 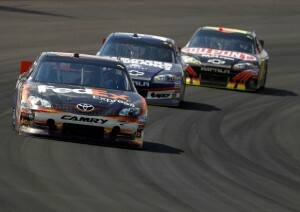 He was followed to the checkered flag by Mark Martin, Tony Stewart and Jimmie Johnson. Hamlin started fifth in the #11 FedEx Express Toyota and dove the inside of turn one on the first lap at the newly-paved ‘Tricky Triangle.’ The car got loose and Hamlin washed up the track a bit, making contact with Carl Edwards. Caution for another incident later in the lap allowed Hamlin to come to pit road for repairs, and more yellow flags early in the race allowed the team to work back the track position. Nearing the race’s midpoint at the start of green flag pit stops, Hamlin was going to pit for four tires and fuel, but he ran out of gas at the exit of turn one and had to coast around to pit road. He lost a lap to the leaders in the process, but used the ‘wave around’ a short time later to get back on the lead lap. Another caution came just outside the team’s fuel window to make it the distance — and Hamlin stayed on the track while others pitted. Two late yellows gave Hamlin enough gas to stretch it to the end, and the four-time Pocono winner was rewarded for the team’s hard effort throughout the day. The finish keeps Hamlin fourth in the NASCAR point standings following Pocono, 19 markers behind leader Matt Kenseth after 14 of 26 regular season races. The Series returns to action at Michigan International Speedway on Sunday, June 17.